What is dreamier than riding in a carriage through a beautiful historic downtown district, holding hands under a blanket or kissing beneath the moonlight? Start off your Annapolis wedding photography session with a memorable ride in one of the city’s horse-drawn carriages. Your wedding party can hang behind while you and your beau embark on a romantic trot past historic colonial era homes, or bring the whole group along in one of the wagonettes. Your wedding photographer can ride alongside you and your group and take some great candid shots of you sipping hot chocolate or champagne as you are chauffeured about the city. A kissing shot is a must in the back of any horse-drawn carriage, so pucker up to your new spouse and let your photographer capture your love on film (or digital). If carriages aren’t your cup of tea, why not try commissioning a trolley car? You and your wedding party can use the trolley to transport you from wedding ceremony to your reception site anywhere around Annapolis. Wedding photographers can also capture some gorgeous pictures in this unique setting along the way. Each trolley can comfortably hold up to 23 of your nearest and dearest, so pack it full of your wedding attendants and family members for some truly impressive images. Pose with your wedding party inside the bright, oak interior, which you can decorate with floral garlands for added ambiance. When you reach your destination, snap a few more shots before heading inside. The vibrant red color of the trolley’s exterior looks great as a backdrop for your ivory or white bridal ensemble. Get some pictures of the entire wedding party in front of the trolley’s ‘Just Married’ sign, or leaning out of the sliding glass windows. For the perfect final picture in your album, have the bride and groom hang out the trolley door and wave ‘goodbye’ to friends, family, and guests. Annapolis is a thriving metropolis, and its jewels are not only limited to downtown; Annapolis wedding photography sessions can be as varied as you want. To give your shoot a truly eclectic vibe, try weaving your itinerary through the city’s three major areas. Start off in the historic downtown district and take some photos at St. Anne’s Church. The church’s brick façade and towering steeple make for some elegant shots of you and your wedding party. St. Anne’s was built three times on the same plot, after separate incidents destroyed the original and restored buildings. That kind of history and resilience hints at a similar hardiness for your impending marriage. Next, walk down to the City Docks, or as the locals refer to it: Ego Alley. With lavish yachts and opulent schooners galore, this area is a prime space for the wealthy to show off their vessels. Pose for some group shots in front of the harbor with some of the boats floating in the background. Finally, take the bus from downtown up to West Street in uptown to complete your Annapolis wedding photography session. Once a run-down section of the city, West Street has been restored and now brings a lively presence to the city’s uptown area. With colorful boutiques, restaurants, and galleries, West Street provides a small town feel in the heart of the city. Traipse from block to block with your wedding party, window shopping as your wedding photographer snaps some cute candid shopping shots. Pose beside the vibrant buildings that flavor the local area. To end your photo shoot, stop off at one of the area’s restaurants for a relaxing drink and to absorb all of the fun from your special day, then head on to your wedding ceremony or reception and have a ball! A few minutes south of the city by car, Quiet Water Park is an ideal setting for your Annapolis wedding photography session. Entrance is only $5 per car, and for that fee you and your wedding party will be able to create stunning shots in the park’s 340 acres of mixed terrain. Head off on one of the paved (or unpaved) trails—the park boasts miles of both—and start posing for some great group shots with the lush greens of hardwood forest as your own personal backdrop. Take some adorable couple shots of the bride and groom kissing in front of one of the park’s panoramic views over the South River. For a more traditional atmosphere, use the formal garden at the Visitor Center with its white gazebos and beautifully carved wooden benches. Step inside the Visitor Center for a brush with some great artwork from local area artists. Peruse the gallery’s collection while your photographer works to take some journalistic-style pictures of you and your crew. 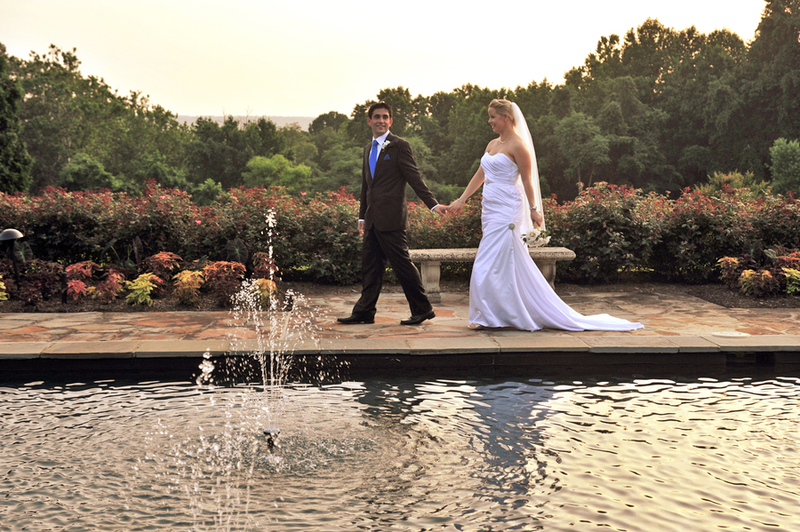 To complete your Annapolis wedding photography shoot, try for a more simplistic background for a Zen-like feeling. A white dress, a black tuxedo, blue sky, and the park’s grassy expanses can make for some subtle but stunning shots for your album. Quiet Waters Park has more than enough to give every bride the wedding photo album of their dreams.